Halloween is past but I couldn't pass up the opportunity to show the Porsche-identified broom that Mary "The Wicked Witch" Richter used as transportation to a Halloween celebration recently. Mary reports that she arrived at the destination ahead of all of the other goblins, thanks to the extra boost that comes with Porsche engineering. In this issue, find biographies and information on how to cast your vote to elect four members to serve a two-year term on the board of directors. Also, check out event reports for the Oct. 17 drive to breakfast and the standing-room-only tech session on Oct. 31. Read a fitting tribute to Bob Schoessow, one of the region's founding members, who passed away last month. And, last but not least, check out news from Porsche, including an announcement and pictures of the new Boxster Spyder which is being unveiled at the LA Auto Show. Remembering founding member Bob Schoessow. Read this tribute to Bob Schoessow, one of the founding members of the Milwaukee Region, who passed away in late October. Oct. 17 drive to breakfast -- read the recap of this event that was enjoyed by members on a beautiful day in mid October. Porsches paraded through towns in Walworth County en route to pancakes and more. Oct. 31 tech session draws out the do-it-yourselfers eager to learn about protecting and improving the paint on their Porsches. Read the event report and check out the photos here. Election -- Hear ye, hear ye, the polls are open and your vote is needed. It's time to elect four members to the board to serve the next two-year term. Read the ballot information from the Nominations Commitee here and exercise your right to elect members to the board. Read the results of a survey conducted by the DE committee to get member input. Dec. 3 -- Board meeting. All members are always welcome to attend the monthly board meeting. The meeting begins at 6:30 p.m., at Brew City Grill, 10250 N Cedarburg Rd., Mequon, WI 53092. Brew City is on Hwy 57 between County Line Road and Donges Bay Road. Classifieds -- online everyday here. 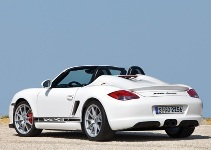 Read the details of Porsche's newest Boxster model, the Spyder. Regional support center opened in Pennsylvania. October sales up 15 percent. Details here. Porsche builds new paint shop with environmental technology. Details here. You can always find our online library of Steinlifters Online here.